Samoa Airways says its international jet schedule will return to normal from today, Tuesday 15 January. The airline’s international flights during 6-14 January were rescheduled, after its Boeing 737-800 aircraft made an unplanned overnight stopover in Sydney on 05 January due to unsuitable weather conditions and the Sydney Airport curfew. As part of efforts to clear the back-log of affected customers, Samoa Airways chartered a Qantas 737-800 aircraft on Thursday 10 January to operate its Sydney/Apia/Sydney flights while its aircraft operated on the busy Apia/Auckland/Apia route. The disruption took place during an extraordinarily busy week for the airline, with supplementary flights which had been scheduled in 2018 and its impact was exacerbated by the limited availability of spare aircraft for charters due to the busy Festive Season. As it prepares to return to schedule, Samoa Airways reminds its customers that check-in for flights between Apia, Auckland, Sydney and Brisbane opens 3-hours before departure and closes 60-minutes prior. The unfortunate recent turbulences undermining the national carrier did not deter true Samoan patriots from raising their hands up to be part of the solution and not the problem. Samoa professions in the airline industry have come out in force to work for their national flag carrier. Among them includes Samoan pilots Patrick Moore and Andrew Roebeck to name a few who have left their comfort zones and sacrificed lucrative salaries overseas to be part of the growing Samoa Airways family. 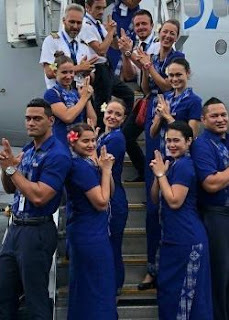 While Cabin Services, you will find the return of some familiar and friendly Samoans who have decades of first-hand and priceless experience to share with their full Samoan Cabin crews. Ropati Eves is back in the fold joined by Mary Pavitt Chang and of course who could forget Leataataoletaeao Blakelock; all renowned prominent Samoan cabin crew pioneers who have served their industry with distinctions. “It’s all about Samoan pride for us,” says Blakelock. “To serve our people and our national flag carrier in this challenging industry is an indescribable privilege. “We are proud Samoans and this is how we show our pride to the world.” And their presences is providing a massive dose of confidence for rookies such as Lumaava Tuna Papalii. Simply put, “Samoa Airways is here to stay,” reaffirms Prime Minister Tuilaepa Lupesoliai Dr. Sailele Malielegaoi. Calling the return of Samoa Airways to the international circuit long overdue, Prime Minister Tuilaepa said. “Having our own airline ensures that we will be able to determine our destiny. He said the decision to set up Samoa Airways was “based on sound and well researched studies.